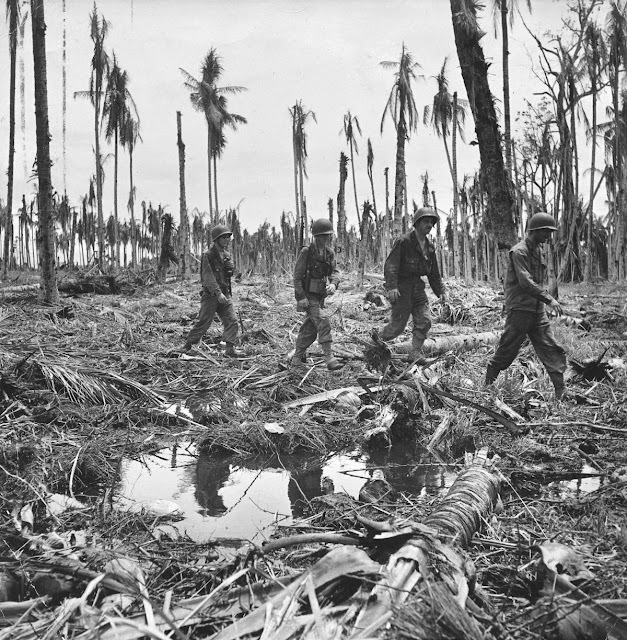 The Battle of Buna–Gona was part of the New Guinea campaign in the Pacific Theatre during World War II. 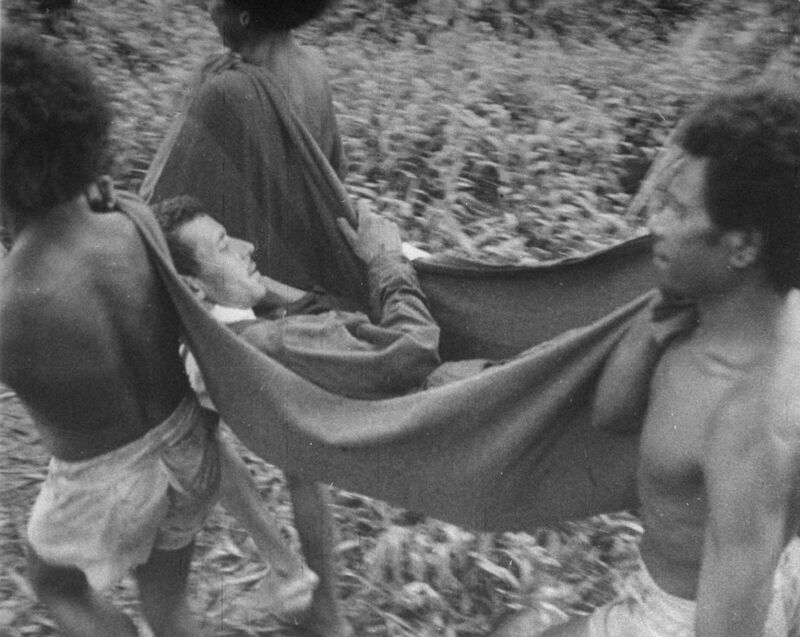 It followed the conclusion of the Kokoda Track campaign and lasted from 16 November 1942 until 22 January 1943. The battle was conducted by Australian and United States forces against the Japanese beachheads at Buna, Sanananda and Gona. From these, the Japanese had launched an overland attack on Port Moresby. 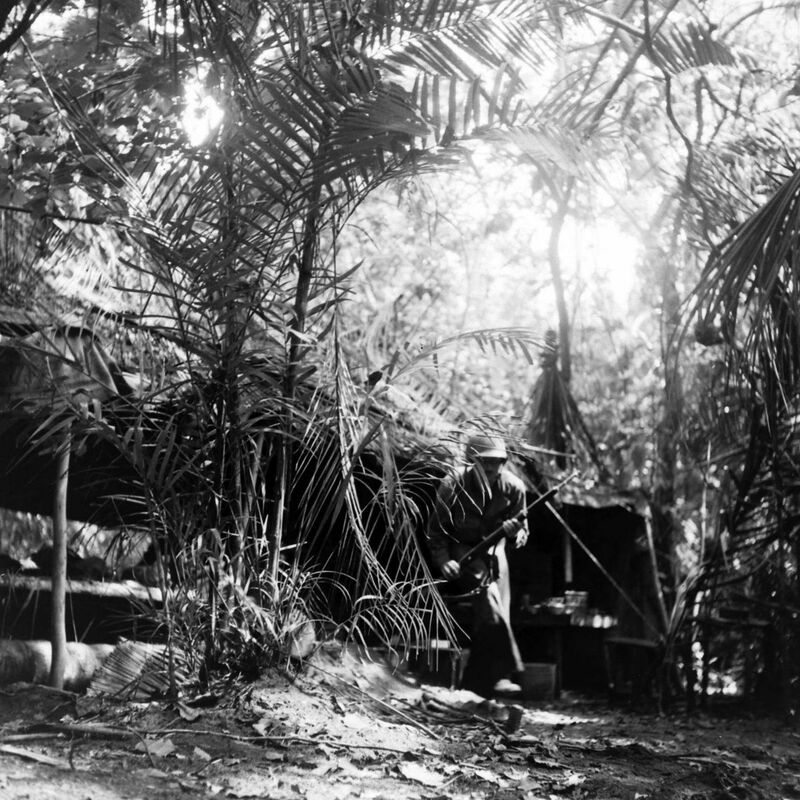 In light of developments in the Solomon Islands campaign, Japanese forces approaching Port Moresby were ordered to withdraw to and secure these bases on the northern coast. Australian forces maintained contact as the Japanese conducted a well-ordered rearguard action. The Allied objective was to eject the Japanese forces from these positions and deny them their further use. The Japanese forces were skillful, well prepared and resolute in their defence. They had developed a strong network of well-concealed defences. American troops, Buna, New Guinea Campaign, World War II. 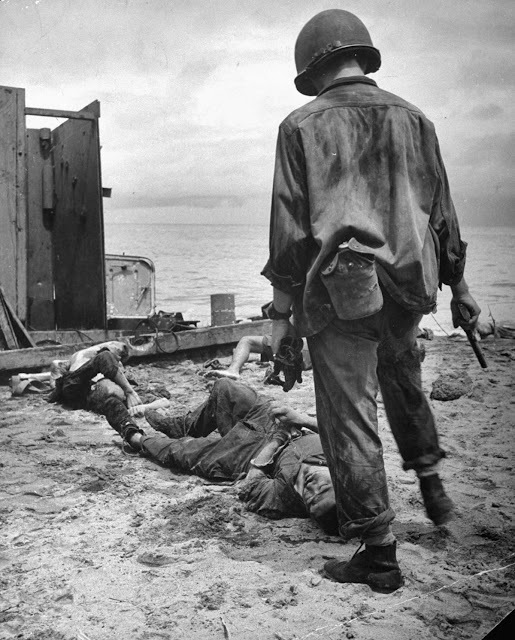 An American soldier stands over a dying Jap whom he has just been forced to shoot. The Jap had been hiding in the landing barge, shooting at U.S. troops. New Guinea Campaign, 1942. 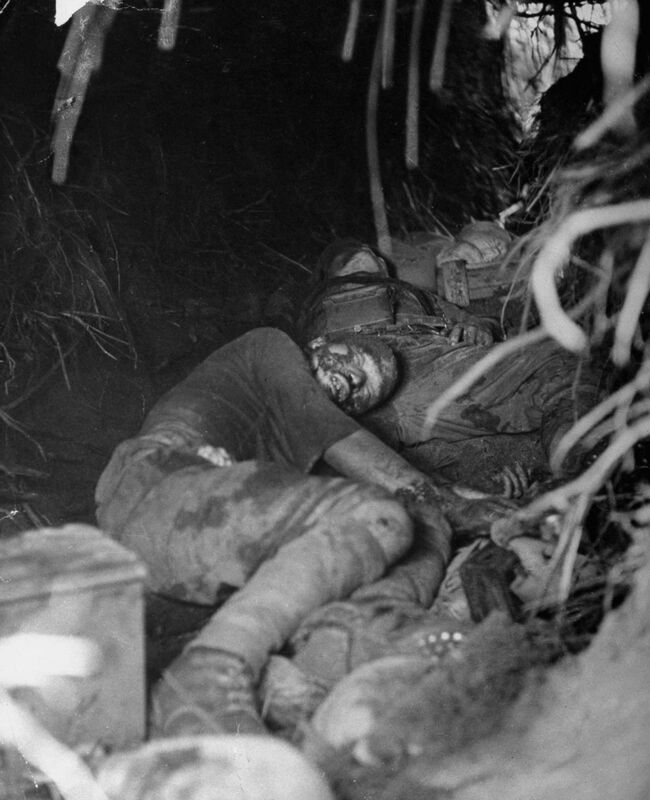 A wounded Jap lies in a destroyed pillbox at Buna Mission. A minute later, he rose up, tried to throw a grenade which he had hidden in his left hand. Over Jap-built bridge walk Americans on patrol. 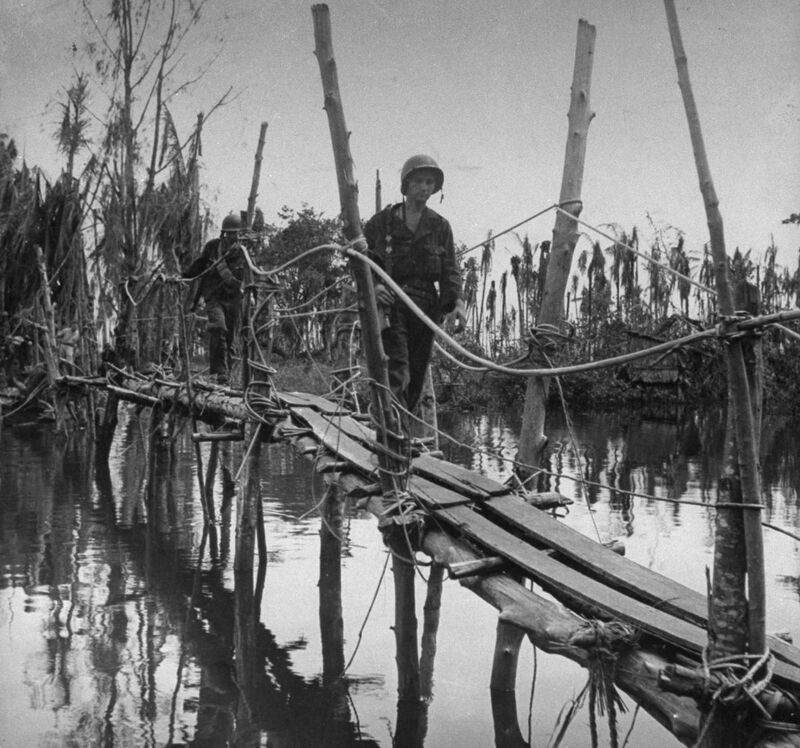 It connects Entrance Creek Island with Buna Mission and one end of it was blown by Japs. Americans repaired it. Lieut. 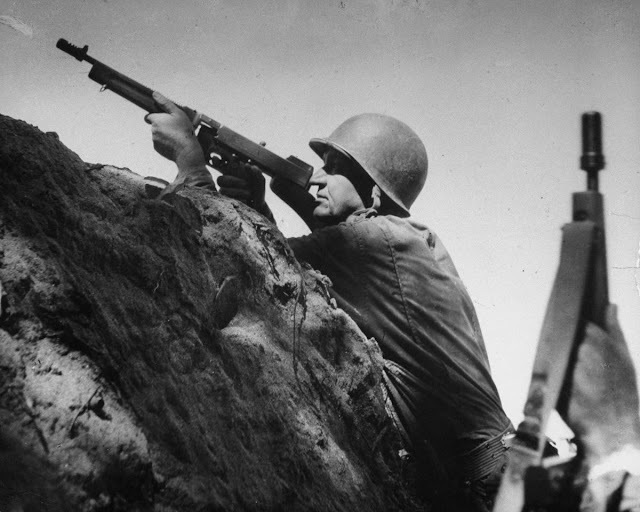 General Robert Eichelberger fires a tommy gun at the Japs. 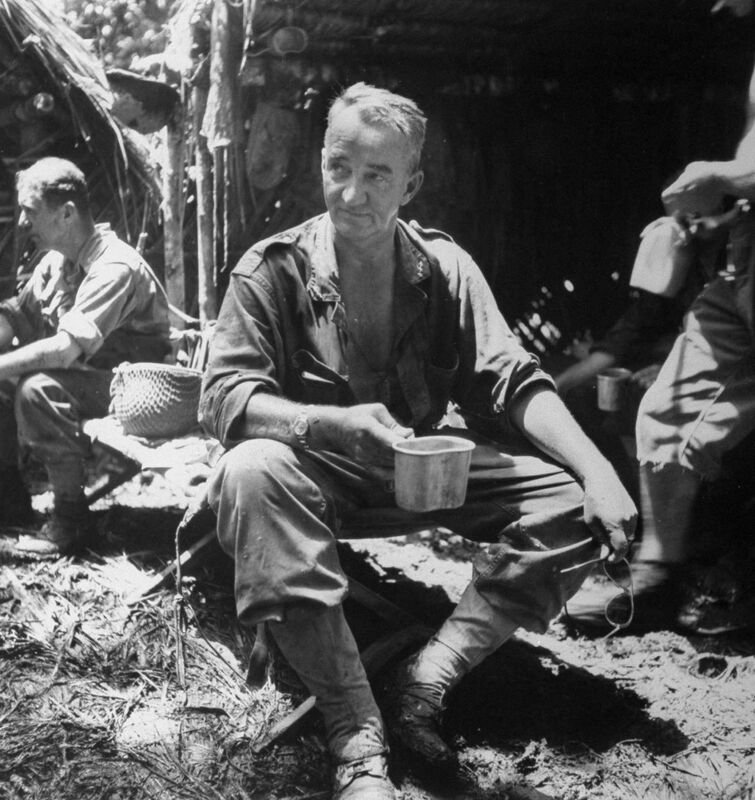 At a medical collecting station Gen. Eichelberger stops for tea. 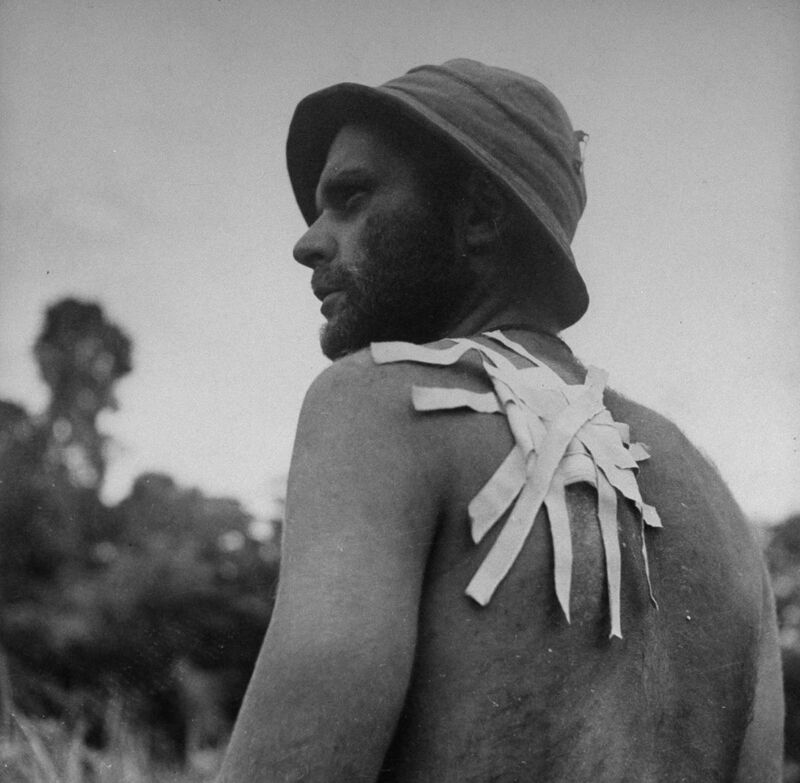 Soon he was on his way again, walking toward the Buna front through mud to his knees. 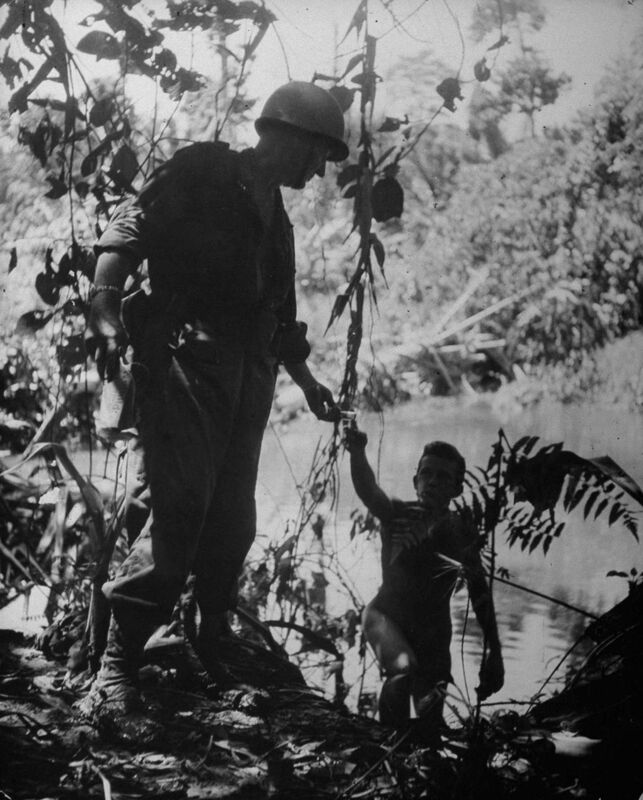 The general [Eichelberger] gives cigarets to a dripping soldier taking a bath in a swamp creek. These cigarets were his own personal issue. In the beginning of the campaign they were especially scarce. 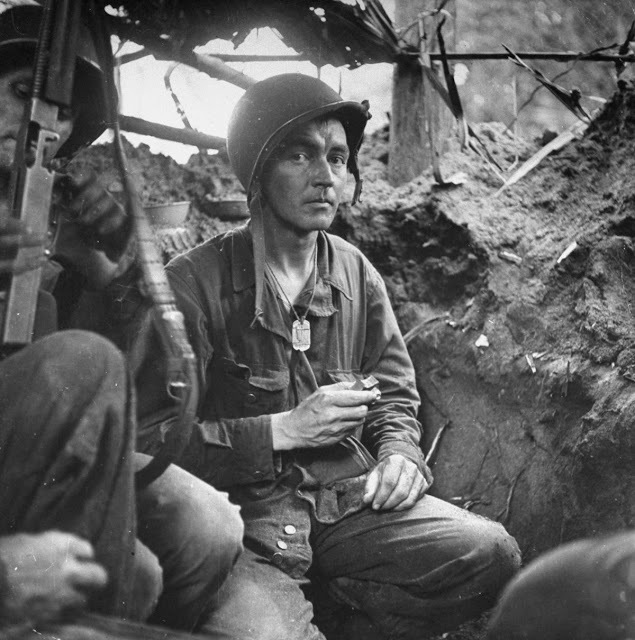 American Captain Byron E. Bradford in a trench during the fight against Japanese forces holding the area. 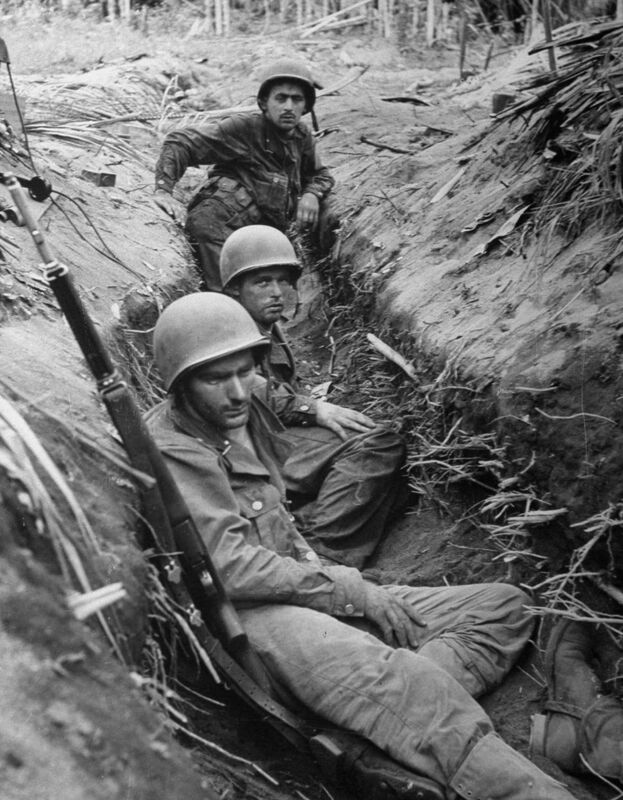 In a captured Jap intercommunication trench, soldiers rest and clean their guns. Sniping is going on right above them. Jap 6.5-MM. 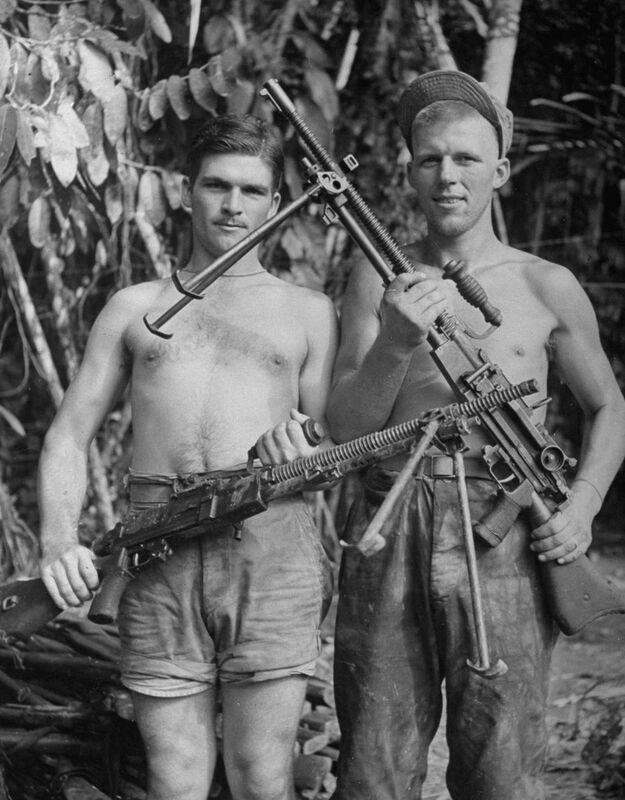 light machine guns (.25 cal.) are displayed. The key weapons in Jap infantry attacks, they weigh 22 lb., fire 550 rounds a minute. 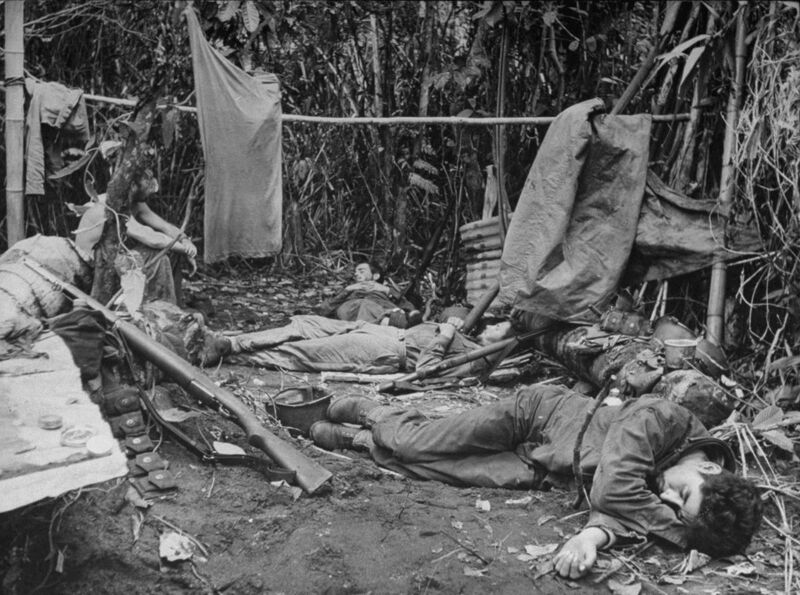 A few hundred yards behind the lines U.S. soldiers flop in exhaustion, trying to sleep and dry their clothes as best they can. 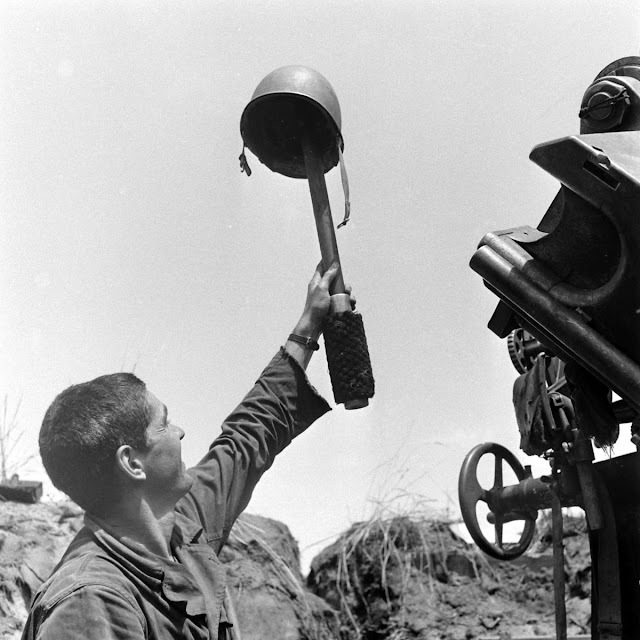 A U.S. soldier uses his helmet to draw Japanese sniper fire, Buna, WWII. 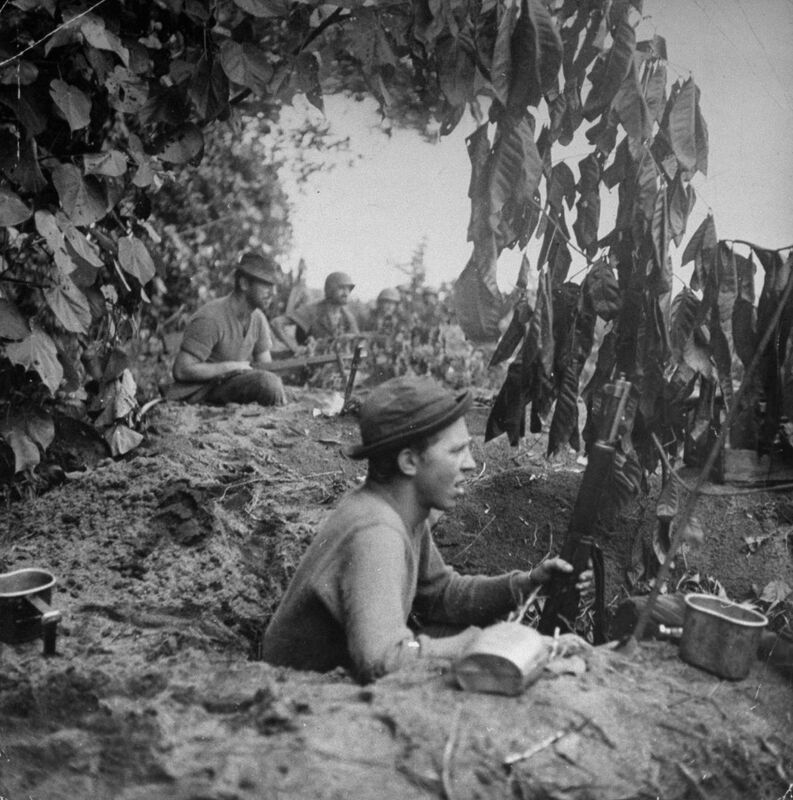 On Bottcher's Corner men dig into foxholes to support machine-gun positions directly ahead of them. From the end of the corridor carved out by Bottcher's men between Buna Village and Buna Mission. A minute later one of these men was wounded. 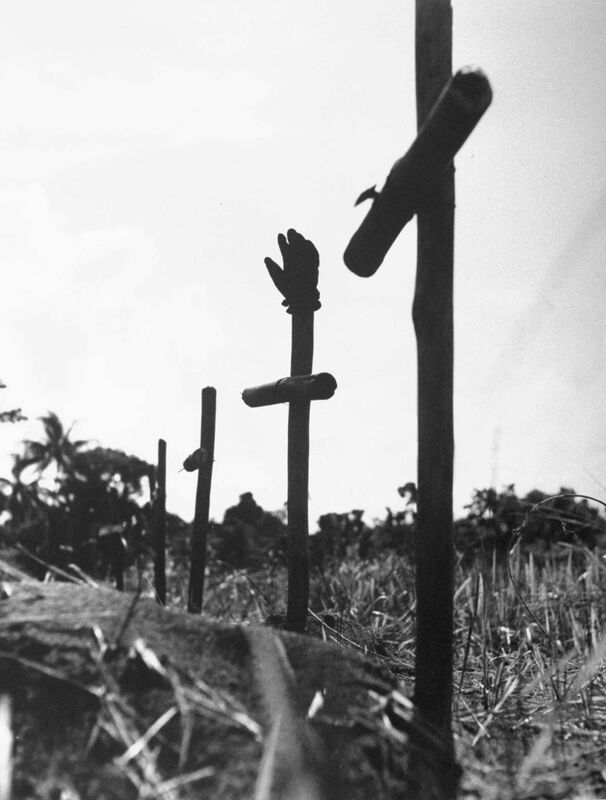 Buna, New Guinea Campaign, WWII. 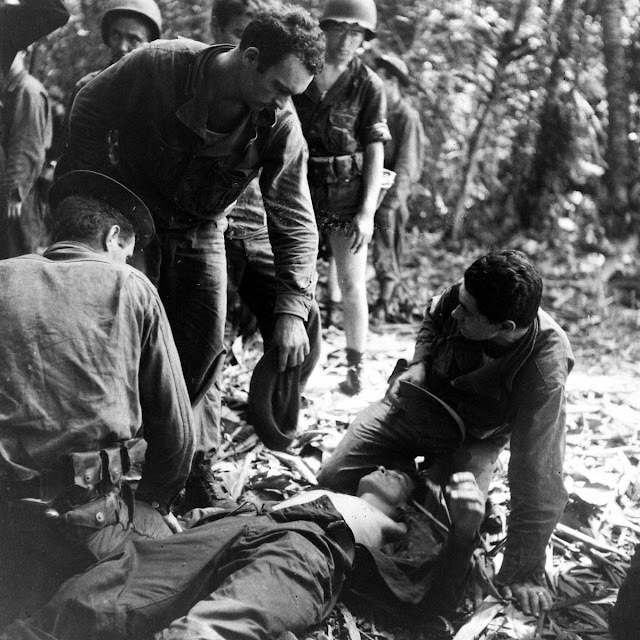 A soldier with fever is aided by fellow soldiers, Buna, New Guinea Campaign, WWII. 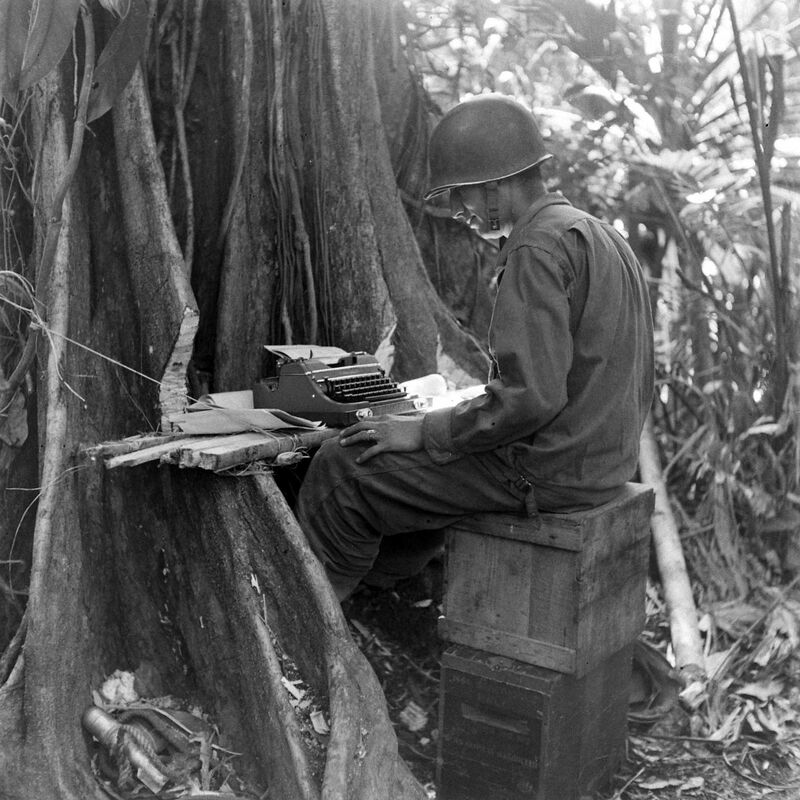 Typing at an improvised table, Buna, New Guinea Campaign, WWII. 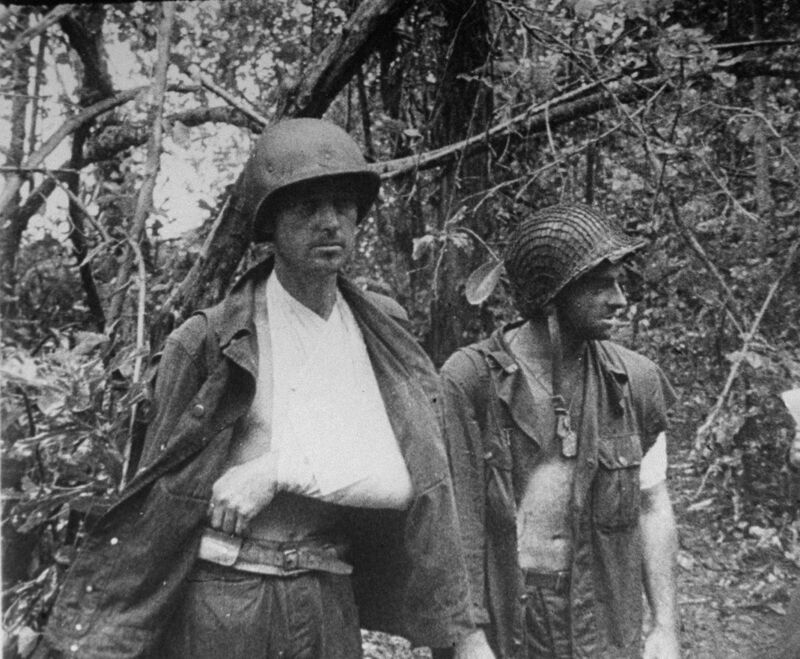 Wounded U.S. troops, Buna, New Guinea Campaign, WWII. 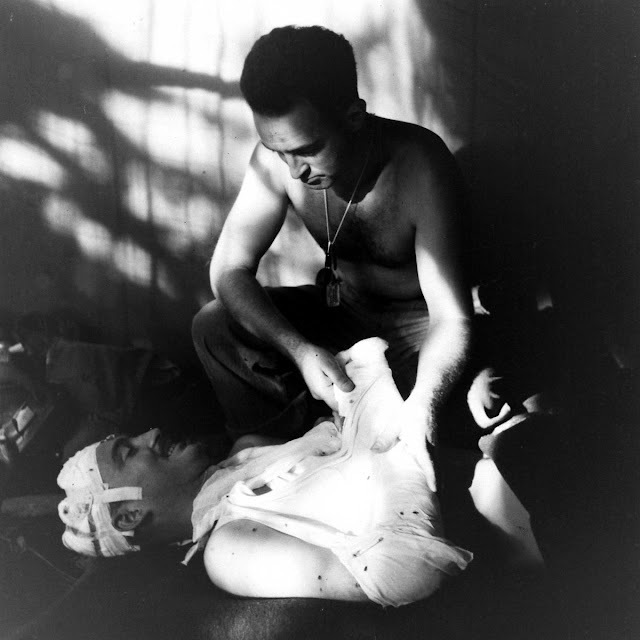 Treating the wounded, Buna, New Guinea Campaign, WWII. 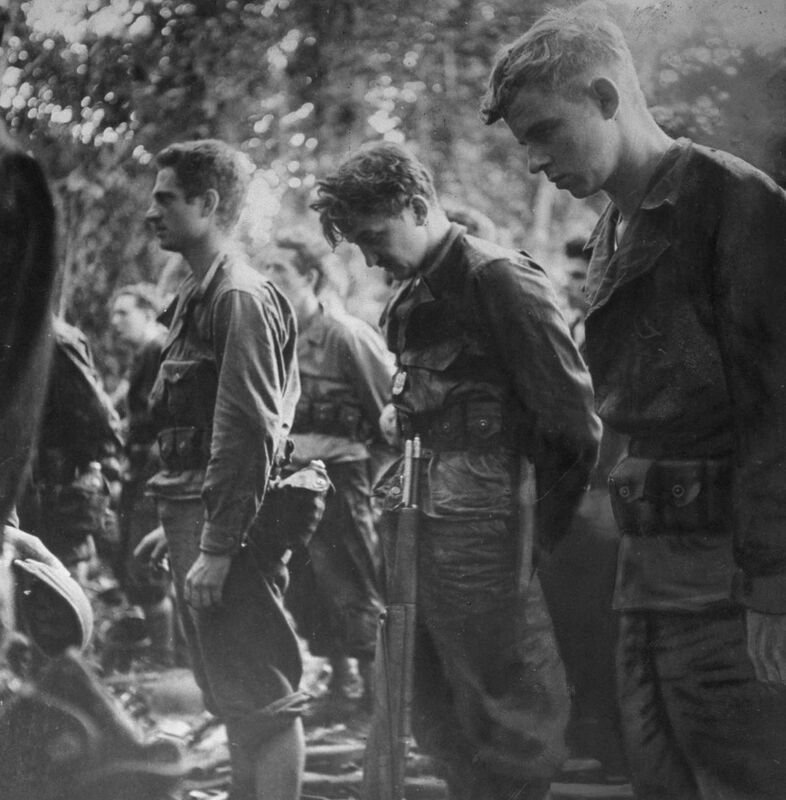 At church service soldiers who have just captured Buna Village look straight ahead or bow their heads in prayer. Said Captain Boice, their commander: “This is not the first time Americans have carried guns to church and it will not be the last.” Later Captain Boice was killed. A line of crude crosses marks American graves near Buna. A grave registrar's glove accidentally points toward the sky.